2011 was the 150th birth anniversary year of the great myriad-minded Indian/Bengali poet, philosopher and Nobel Laureate Rabindranath Tagore (1861–1941). Celebrations were frequent in India and Bangladesh but also all over the world, including Scandinavia. 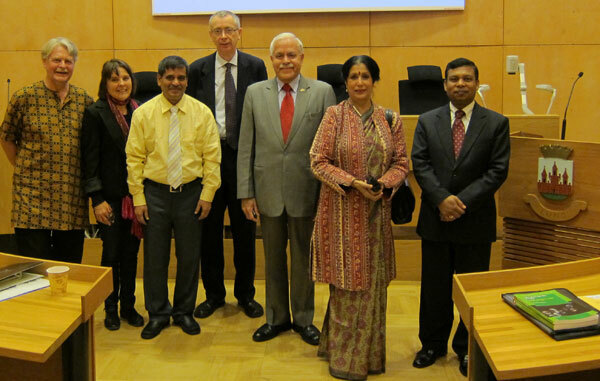 In Sweden, SASNET organised a week-long Tagore celebration week in March 2011 in collaboration with other organisations. 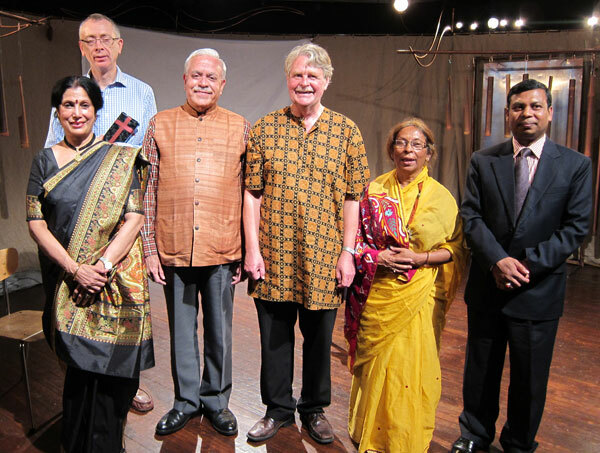 The programme included concerts, poetry recitals, an academic full-day seminar, film shows and popular lectures by leading Swedish experts on Tagore’s life and literary work. 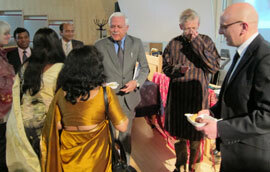 SASNET organised another Tagore celebration week in Lund already 20–24 March 2011. 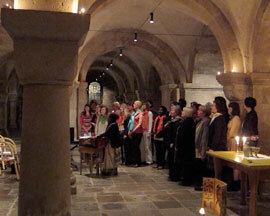 The programme even included a Sunday evening mass in Lund Cathedral where the choir Svart på Vitt performed the song ”Ontoro Momo” by Tagore in Bengali language (photo). In collaboration with other local institutions and organisations, the week included popular lectures by by Prof. William Radice, Dr. Olavi Hemmilä and P-O Henricson, Swedish experts on Rabindranath’s life and literature, as well as exhibitions, film shows, concerts and poetry reading. The seminar programme, prepared by SASNET’s deputy director Lars Eklund, also included lectures by Dr. Claes-Göran Holmberg, Comparative Literature, Centre for Languages and Literature, who talked about ”Tagore in Sweden and the Nobel Prize of 1913”, and Mag. Art Annemette Karpen from Copenhagen who talked about ”Tagore’s Drama Production, and Satyajit Ray’s films based on Tagore works”. 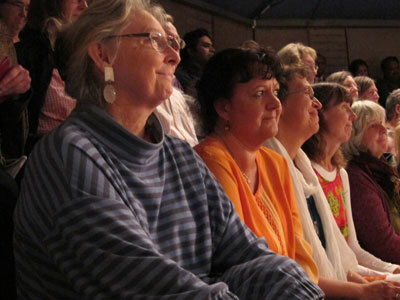 Detailed information about the March 2011 Lund Tagore Week. This was followed up by celebration events in Gothenburg/Mölnlycke and Uppsala around Rabindranath’s actual birth anniversary date on 7–8 May 2011. 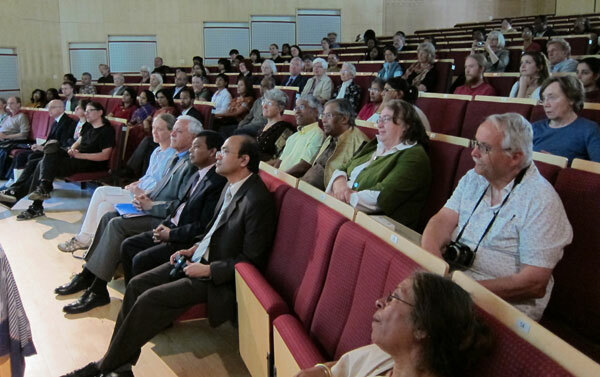 In Uppsala it was organized by the Uppsala University Seminar for South Asian Studies, and a programme has been prepared by Dr. Heinz Werner Wessler, Dept. of Linguistics and Philology. He also held a speech on Tagore’s life and work. Dr. Ferdinando Sardella, History of Religions, Faculty of Theology, then lectured on Tagore and Religion. Trio Creation, with Jonas Landahl, Suranjana Ghosh and Iti Malo from Uppsala, participated with a cultural programme based on Tagore songs, performed on Tablas and Sitar. A range of beautiful Tagore songs (Rabindrasangheet) were also sung and played by Bubu Munshi Eklund from Lund on Harmonium (photo). The event, that drew an audience of more than 100 people, was also attended by the Ambassadors from both Bangladesh and India, Mr. Gousal Azam Sarker and Mr. Ashok Sajjanhar respectively, who both gave inspired presentations. SASNET’s deputy director, Lars Eklund, also participated in the seminar. Read a report by SASNET’s Lars Eklund who participated. Read also an article by Jonas Landahl in Upsala Nya Tidning (UNT) on 8 May 2011. 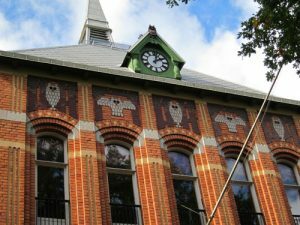 The article is entitled ”Öst mötte Väst – i Uppsala”. Invited scholars for the Tagore seminars in September 2011; Prof. Asoke Bhattacharya, Dr. Reba Som and Prof. William Radice. 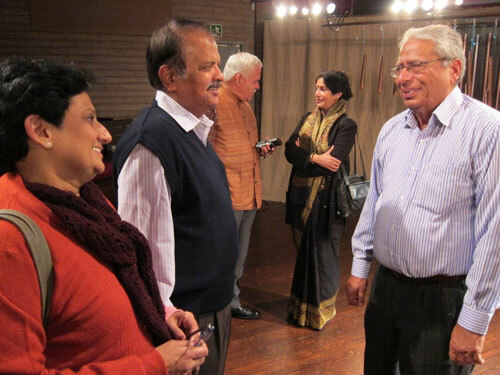 In late September 2011, another series of anniversary celebrations took place in Sweden and Denmark, largely thanks to efforts by SASNET and with kind support from the embassies of India in Stockholm and Copenhagen, and the Indian Council for Cultural Relations (ICCR) in Delhi. 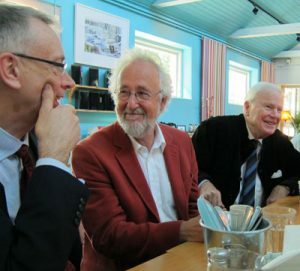 Thereby, three eminent international Tagore scholars – Professor William Radice, SOAS, University of London, UK; Dr. Reba Som, ICCR Rabindranath Tagore Centre in Kolkata, India; and Professor Asoke Bhattacharya, Jadavpur University, Kolkata, India – could be invited to do a Scandinavian tour. During the period 19–23 September 2011, academic seminars were held at Copenhagen University (19th), Lund University (21st), Stockholm University (22nd) and Uppsala University (23rd). 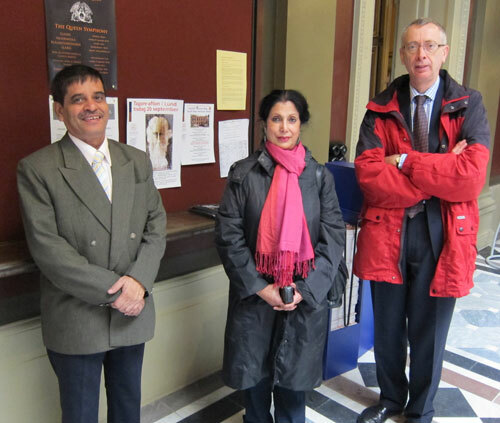 In Copenhagen the seminar was organised by the Centre of Global South Asian Studies at the Dept. of Cross-Cultural and Regional Studies, University of Copenhagen. See the full programme for the Copenhagen seminar. The Tagore celebration in Copenhagen also included an art exhibition. It contained reproductions of Tagore’s paintings, but also modern Bengali pieces of embroidered folk art, Katha from West Bengal and Bangladesh, with motifs taken from Tagore’s short stories, poems and dramas. More information. In Lund SASNET organised the September event on its own. It consisted of two parts, a cultural programme at Teater Sagohuset on Tuesday 20 September 2011 in the evening, and an academic half-day seminar the following day held at Stadshallen, in the session hall normally housing the municipal council. 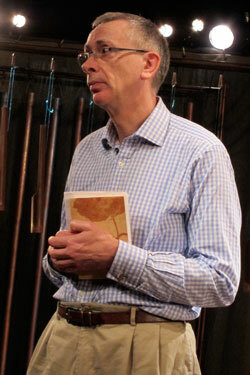 The Tagore programme at Sagohuset was magical, the audience were thrilled to listen to Professor William Radice (photo) reciting his new translations into English of the Gitanjali volume, the one that made the Swedish Academy to award Tagore the Nobel Prize of Literature in 1913. Radice has made a great work in giving new life to the poet’s Bengali orginals. Being a poet in his own right, Prof. Radice has been able to make congenial adaptations of the poems whether they were made as songs or just as poems to read. He has pursued a double career as a poet and as a scholar and translator of Bengali, and has written or edited more than thirty books. He has also given numerous lectures and poetry readings in Britain, India, Bangladesh, North America, Germany and many countries in Europe, not the least during the jubilee year 2011. The cultural programme was attended by two ambassadors, both H.E. Mr. Ashok Sajjanhar, Ambassador of India to Sweden and Latvia; and H.E. Mr. Gousal Azam Sarker, Ambassador of Bangladesh to Sweden, and in the audience could also be found important people from academia and culture in Lund, including the new ICCR Professor to Lund University, Gopal Karanth and his wife Raji, who had arrived from Bangalore only a few days before. Four representatives of the Bangladesh Riksförening, led by Mr. Enamul Choudhury, had travelled all the way from Stockholm to participate in the cultural programme. Tagore’s music, his own compositions of more than 2,300 of his poems, is called Rabindrasangheet, and the audience could enjoy listening to a number of beautiful songs, wonderfully rendered first by Lund’s own professional Rabindrasangheet singer, Ms. Bubu Munshi Eklund, and then at the end of the session by Dr. Reba Som from Kolkata. The latter sang some songs from Gitanjali, where Prof. Radice read out his translations of the same poems. Dr. Som is a trained singer of Rabindrasangeet. Her compact disc, Selected Songs of Rabindranath Tagore from 2004 includes her English translations and transliteration of Tagore’s lyrics. In 2009, she also published a learned book on Rabindrasangheet entitled ”Rabindranath Tagore: The Singer and his Song” (Penguin, New Delhi). After the programme at Sagohuset. From left to right: Reba Som, William Radice, Ashok Sajjanhar, Lars Eklund, Bubu Munshi Eklund and Gousal Azam Sarker. The programme also included the choir Svart på Vitt, that performed the Tagore song ”Ontoro Momo Bikoshito Koro” in near to perfect Bengali language, accompanied by Bubu on Harmonium. The choir was led by its conductor Rebecka Dahlqvist.Bengali snacks – singaras – were served with home made tamarind chutney during the break. The snacks were prepared by Bubu Munshi Eklund and Jasmine Zabbar from Malmö.After the break, a wonderful documentary film entitled ”The mural paintings of Shantiniketan” was shown. This documentary was made by Debabrata Roy only a few years back, and depicted the story of the impressing mural paintings prevalent on a large scale in Tagore’s university town of Shantiniketan since the time of Nandalal Bose, Benodebehari Mukherjee and Ramkinkar Baij. They experimented with different forms and techniques and created along with their students at Kala Bhavan a large body of environmental works that decorate classrooms, hostels and the campus. The tradition of environmental art that began at Shantiniketan in the 1920s continues to evolve through the works of its teachers and students. Many of these, especially the early works, have an assured place in the history of modern Indian art. See the poster for the event including full programme. The following morning, on Wednesday 21 September 2011, an academic seminar was held. The seminar was entitled ”Poet, Philosopher & Citizen of the World. Rabindranath Tagore 150th Birth Anniversary Seminar” and drew a reasonably large crowd of interested people both from academia and culture. It was introduced by SASNET’s Lars Eklund, the key person behind the Tagore celebration events in Lund.The two ambassadors, Ashok Sajjanhar and Gousal Azam Sarker, gave inspired introductory speeches on the role and importance of Rabindranath Tagore and his work. Then followed a lecture by William Radice. He spoke on ”Tagore, Gitanjali and the Nobel Prize”, a presentation much based on interesting facts that he learnt about while translating Gitanjali anew, regarding details on the first publication of Gitanjali in 1913. This was done with the assistance by Irish poet William Butler Yeats, and it turns out that Yeats’ role was in fact more profound than that. A lot of changes both language-wise and sequentially appeared between Tagore’s own manuscript (the Macmillan manuscript as it is called) and the final published volume. Dr. Reba Som followed with a presentation entitled ”The Musical Journey of Rabindranath Tagore”, where she presented the different styles of music that together form the Rabindrasangheet music genre. 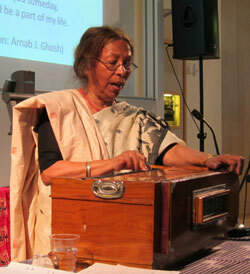 She sang six songs, and accompanied herself on the Harmonium. Finally, Professor Asoke Bhattacharya from Jadavpur University in Kolkata lectured on ”Tagore’s pedagogic ideals as manifested in Shantiniketan”. Prof. Bhattacharya became Director of Adult, Continuing Education and Extension Centre at his university in 1987. He engineered one of the most vigorous continuing education programme in India offering more than forty courses per annum and enrolling around 1000 students each year. Besides, he has written several books on education and a large number of articles. He specializes on Tagore’s concept of Lifelong Learning. Prof. Bhattacharya has also been involved in Indo-Swedish projects comparing the efforts by Tagore and Grundtvig, both at Gothenburg and Lund universitites. The seminar at Stockholm University was held on Thursday 22 September 2011. This full-day programme was jointly organized by the university’s Dept. of Oriental languages, and Dept. of Theatre and Dance Studies, and being coordinated by Professor Willmar Sauter and Dr. Christina Nygren. It was held in the auditorium at the Dept. of Oriental Languages, Kräftriket 4A. Besides lectures by the three international speakers (the same as in Copenhagen and Lund), the organisers had also invited a few complimentary Swedish speakers, namely Professor Kjell Espmark from the Nobel Prize Committee/Swedish Academy, who spoke on “Tagore and the Nobel Prize”; and Dr Stephan Larsen, Department of Literature, Stockholm University, who spoke on “Early Swedish translations of Tagore”. Bubu Munshi Eklund from Lund was specially invited to sing Rabindrasangheet with her excellent timbre. Unfortunately, Dr Olavi Hemmilä, Comparative Literature, Dalarna University, had to cancel his participation due to illness. He was supposed to speak on ”Tagore’s tour to Sweden and impact on the writings of Dan Andersson”. See the full programme for the Stockholm seminar.The Indian Ambassador invited the speakers and organisers of the Tagore event in Stockholm to a reception in the evening. It was held at the Ambassador’s residence, and coincided with a visit to Sweden by the Indian Minister of Communications and Information Technology, Mr. Kapil Sibal. 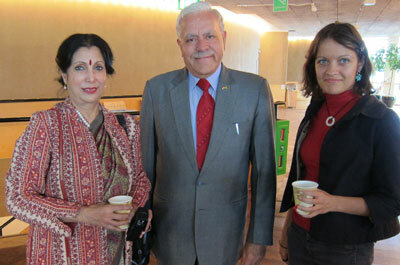 In Uppsala, the commemorative event was organised on Friday 23 September 2011 as a Public Workshop featuring Reba Som and Asoke Bhattacharya, but not William Radice who had travelled on to a seminar in Amsterdam. It was organized by Uppsala University’s Forum for South Asian Studies in collaboration with the Dept. of History, the Dept. for Comparative Literature and the Dept. for Linguistics and Philology. More information. In an article entitled ”Timeless Tagore”, published in the Indian magazine Frontline, 13 January 2012, he gives a broad overview of the exciting and fascinating events, and a hope that they will contribute to a new appreciation of Tagore as a thinker, and in the long run enhance the understanding of his creative achievements. Go for William Radice’s article.